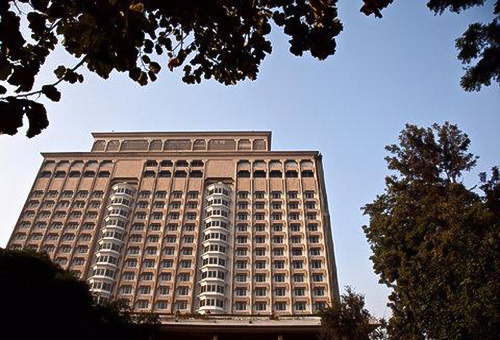 A distinguished address in India's capital, this 5-star hotel is a New Delhi landmark, with elegant interiors and finely appointed rooms reflecting traditional Mughal heritage in art, antiques and ambience. One of the most distinguished addresses in the national capital, the 5-star Taj Mahal Hotel is a city landmark, located in the exclusive residential area of Lutyens’ Delhi close to the seat of government and foreign embassies. The hotel’s elegant interiors reflect the heritage of Mughal Delhi, with intricate motifs, golden inlay work, marble fountains, original art and a veritable showcase of historic artifacts. Exuding refined ambience, the hotel's 294 spacious guestrooms enjoy views over the city or pool and gardens through panoramic windows. Each room is appointed with every amenity befitting a property of this caliber. The health and fitness center features steam baths, sauna, Jacuzzi and traditional Indian Ayurvedic massage and Sirodhara treatments. A suite of restaurants offers a wide range of cuisines and beverages, and classic afternoon tea is served each day in the Machan and Emperor Lounge. Ideally located near the Taj Mahal, this new hotel offers spacious guest rooms with sophisticated decor and top-quality amenities, including a spa offering traditional ayurvedic treatments. Ideally located near the Taj Mahal and Agra Fort, the new Courtyard Marriott Agra provides 5-star amenities and some of the largest guest rooms in Agra. Air-conditioned rooms feature streamlined modernist decor in a contemporary palette of gray, white and chartreuse. Furnishings include a plush pillowtop king-size bed or two twins with luxury white cotton linens, flat screen TV and writing desk. Marble bathrooms have a spacious shower, hair dryer, robe and slippers. Rooms also have high-speed Internet, mini bar, safe, coffee maker and tea service. A daily newspaper is available on request. The Unora Spa offers traditional Indian ayurvedic treatments including massage, body scrubs and facials. An outdoor swimming pool and indoor fitness center provide recreation and exercise. Four different dining and drinking options are offered on site, from fine Indian dining at Anise to cocktails in the Onyx Bar. Set among landscaped gardens, courtyards, reflection pools and fountains, this award-winning property offers resort-like ambience in the heart of the greater New Delhi region. 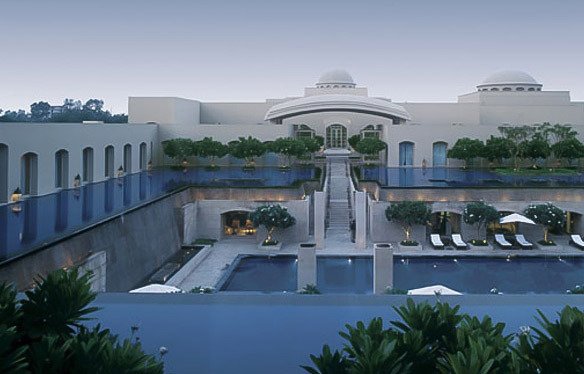 Voted "Asia's Leading Hotel" multiple times at the World Travel Awards, the Trident Gurgaon is located in the central business district of Gurgaon, part of the New Delhi national capital region, just 30 minutes from the international airport. 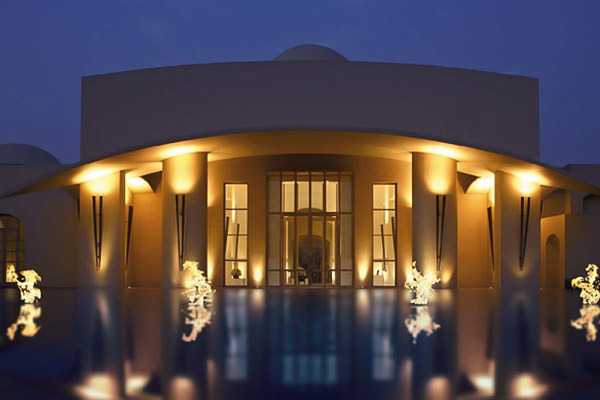 Designed by Thai architect Lek Bunag, the low-rise hotel is set amid seven acres of landscaped gardens, courtyards, walkways, reflection pools and fountains, creating a resort-like ambience. The hotel's 136 rooms are defined by warm, understated contemporary decor and enjoy serene views of the gardens and manicured lawns or the reflecting pools. Three restaurants feature world, Indian and Japanese cuisine, and an elegant bar offers drinks in a sophisticated setting. A separate pool bar serves beverages and casual fare alongside the magnificent outdoor swimming pool, while a spa and fitness center complete the hotel’s recreation facilities. I’d like to share Natural Habitat Adventures’ Agra and the Taj Mahal... You might be interested! You can also request Nat Hab's Catalog of the World's Greatest Nature Journeys for more information about the company's worldwide adventures.